What is that you ask? 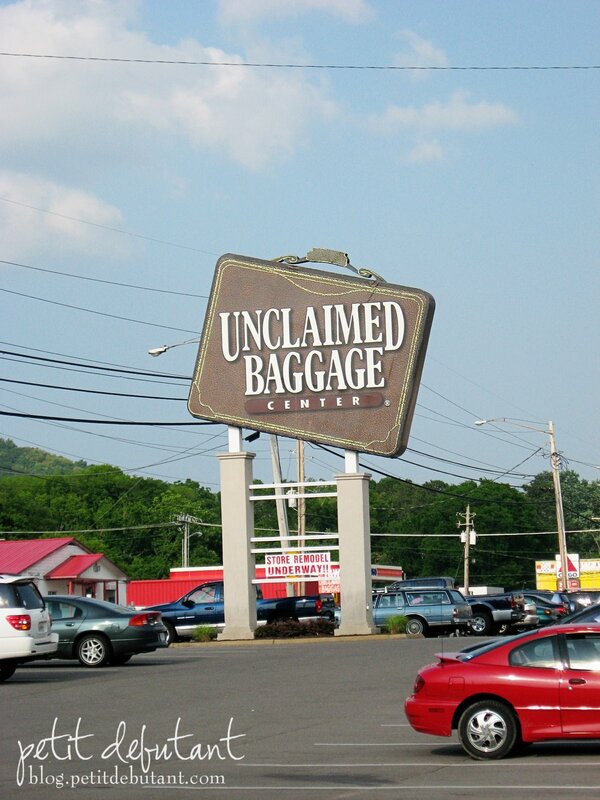 Well if you are ever near Scottsboro Alabama you must stop by and see for your self. This little hidden gem is a treasure trove of awesome deals! It has been on our "to do list" for a few years. My husband had a few jobs in Cullman Alabama with his previous employer (when we were still living in TN) and every time I got to tag along we would promise to go check it out "this time." It never happened. This year on the way back from my triathlon in Tullahoma TN, we took a detour and went to Russel Cave National Monument. After we were done there we hopped back in the car and I looked at the map and realized we would be going through Scottsboro on the way home. Something jogged my memory and I remembered about the UBC. What exactly is it? Well the Unclaimed Baggage Center is were lots of orphaned baggage ends up. Here it is sorted and items are put up for sale to the public. What kind of items? Everything you could imagine and more? The best part is that most of it is in like new or new condition! They do a really good job of sorting stuff and you won't really run across any "junk." The prices are definitely varied, I think they discount the stuff that has been there longer. There are lots of clothes, books, electronics, shoes, jewelry, sports equipment, etc. You would be surprised at the things people bring or buy on vacation! Some of the stuff was overpriced in my opinion(that's the bargain hunter in me!) but most of it was moderately priced. A DSLR was going for about $300 but you don't get any guarantees as to how long it will last (most of the more expensive electronics are checked and tested, but still you are buying used.) We made a few purchases the best bargain being a two piece suit for my husband for a mere $30! Actually there were some really nice $500 Ralph Lauren 3 piece suits that still had tags on them for only $100! We also bought a very pretty smocked dress for my daughter that looks brand new for $7. A Cinderella dress up dress (all the glitter is there so I think it's new!) $6. There were one or two more items we bought all at a great bargain! Bambi bought the dress she wore on Sunday and Ashleigh got some cool bracelets. It is indeed a great place to shop! I have heard of that wondrous place! My dad does audits in AL sometimes and I think he's been there. Now I just need to figure out if it's close enough to be worth a road trip! This is so funny, I was just talking to my Mom yesterday about going there while she is here visiting. It is on our list for next week. Always wanted to go there, too...how far away from the Boro is it, do you think? Glad you had a good time and glad your friends want to come check us out. Be sure to make plans to come back and see us Labor Day weekend. We will be celebrating our 40th anniversary and will have lots of goodies to give away. It will also be the "unveiling" of our store remodel. We are excited! !